The Hockomonkey is a Dream Eater that appears in Kingdom Hearts 3D: Dream Drop Distance. 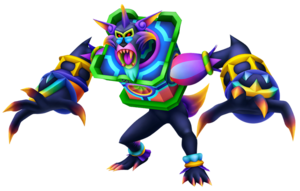 It serves as the boss of Traverse Town and is fought by both Sora and Riku. The Dream Eater's name contains the Japanese words for "box" (箱, hako?) and "monkey" (猿, saru?). His appearance is based on a mandrill. The version that Riku fights, however, is also reminiscent of some stage magicians who wear shirts with flowy sleeves while performing. In the first visit to Traverse Town, Sora and Rhyme meet Neku at the top of a garden plaza in the Fifth District. Neku apologizes to Sora for handing him over to the hooded figure. Sora accepts his apology and then asks if Rhyme is his partner, to which Neku says she is not. Rhyme then disappears just as the hooded figure appears. Neku tries to attack him, but is smacked aside. The hooded figure summons the Hockomonkey before vanishing. Sora fights and defeats it. In Riku's incarnation of the town, he and Shiki encounter Young Xehanort in the Fifth District, who taunts Riku. Beat appears and tells Riku that Xehanort posed as a Reaper and promised to return Shiki to her world if she delivered Riku to him. Xehanort takes off his hood and summons the Hockomonkey in its mage form before vanishing. Riku fights the Dream Eater and defeats it. Hockomonkey is the first Nightmare boss summoned by the Spellican during Sora's second visit to Traverse Town, followed by the Wargoyle and the Char Clawbster. Shake Off (振り払い, Furiharai? ): A two-strike backhand attack. Trick Kick (トリックキック, Torikku Kikku? ): The Hockomonkey turns its body upside-down and performs an inverted kick. Guard Bomb (ガードボム, Gādo Bomu? ): The Hockomonkey withdraws its arms, legs, and head inside the box and follows Sora for a short time, before exploding and inflicting Sleep. Wall Kick (壁キック, Kabe Kikku? ): The Hockomonkey jumps off a wall and performs a midair charge in Sora's direction. Long Punch (ロングパンチ, Rongu Panchi? ): The Hockomonkey's hands form into boxing gloves, its arms stretching over a long distance to punch Sora. Hammer Punch (ハンマーパンチ, Hanmā Panchi? ): The Hockomonkey changes into a hammer and slams down on the battlefield. If the attack connects, The Hockomonkey will trap Sora in its head and pummel him with its boxing gloves before knocking him back. Punch Rocket (パンチロケット, Panchi Roketto? ): The Hockomonkey summons floating versions of its boxing gloves that home in on Sora. The Hockomonkey's attacks depend on whether it is using its normal or boxing arms. Occasionally, Hockomonkey will withdraw its arms and summon floating versions of its boxing gloves that will home in on Sora. The safest way to attack Hockomonkey is with Flowmotion attacks. When prompted, Sora can also use Slingshot to toss Hockomonkey and leave it stunned momentarily. When its HP is reduced enough, the Hockomonkey will destroy the glass ceiling and drag Sora with it into the Garden, although it is possible to defeat it before this happens, though it tends to do this earlier in the fight on Critical Mode. Fire (ファイア, Faia? ): The Hockomonkey tosses three fireballs at Riku. Launch Punch (打ち上げパンチ, Uchiage Panchi? ): The Hockomonkey summons boxing gloves that attack Riku from below. Hit (叩く, Tataku? ): The Hockomonkey's hands swipe at Riku. Palm Tree Stamp (ヤシの木スタンプ, Yashinoki sutanpu? ): The Hockomonkey's hands pummel Riku with palm trees coming from the battlefield. Throw (投げつけ, Nagetsuke? ): The Hockomonkey's hands grab objects from the battlefield and throw them at Riku. The Hockomonkey remains in midair for the entirety of its battle with Riku. It mainly attacks by tossing three fireballs at Riku. Midair and flowmotion attacks are the best way to attack the Hockomonkey. 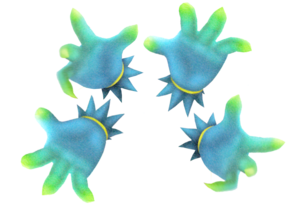 After taking enough damage, the Hockomonkey disperses into four disembodied hands which must be destroyed to force it to reform. Once it reforms, it will be stunned and vulnerable; Riku will sometimes be prompted to use Slingshot to toss the Hockomonkey. As its HP dwindles, Hockomonkey begins using a new attack where it summons boxing gloves to attack Riku from below. 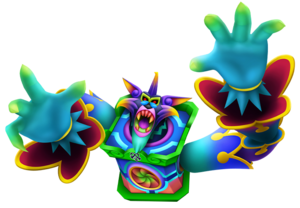 For the Secret Portal rematch, Riku should equip Second Chance, Leaf Bracer, and homing commands like Balloonra or Balloonga. When it replaces itself with its four hands, attack them with the Balloon commands and the Kick Dive and Sliding Dive Flowmotion attacks. When the Hockomonkey's hands begin appearing out of the ground, Riku should endeavor to keep in the air using Flowmotion. This page was last edited on 3 April 2019, at 17:39.